The pain of losing near and dear ones sometimes inspires human to take initiative to change the world for better. Women are the backbone of any household, especially the mothers. In recent days, there are only a few things left on this earth which are impossible for a mother. They can take care of the house, go out to work and earn money or change the whole world. Subhashini Mistry can be considered as the torch bearer of humanity. A vegetable seller and housemaid by profession, the exceptional mother Subhashini Mistry has built a hospital with her life savings. 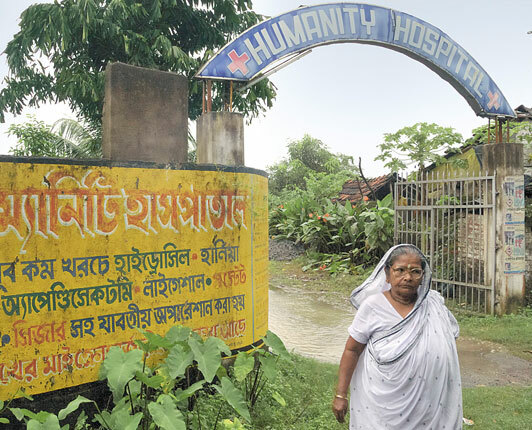 The manual labor is not always the best way to earn money, yet this mother has managed to feed her four children, get them established in a good profession and create a hospital to serve others. At the age of 23, Subhashini Mistry lost her husband due to the poor medical facility in the government hospital. She was left alone to feed her own four children. It’s the loss she had suffered in her own life had inspired her to create the Modern Hospital, which is to save millions of other innocent lives. Mistry was the daughter of a poor farmer family of West Bengal. She had to get married at the tender age of 12 due to her family condition. Her husband was a poor laborer. He died in illness while Subhasini Mistry was only 23. After the death of her husband, she was left to feed her four children. In her own words, she was in shock initially when her husband had passed away. After that, she had realized that she had to feed her own four children. She had no necessary education to land up in a good job. So she took the job of a housemaid to feed her own two children and saving their future. She was forced to send two of them to the orphanage as she couldn’t feed the four children with her own earnings. Her desperation had made her to dream of creating a hospital for the poor so that no one else has to suffer the fate similar to her husband. At the first, she bought one-bigha or a one-third acre of land with her hard-earned money. After buying the land, she understood that working as the maid wouldn’t get her to finish her dream, so she started the job of laying bricks. Her hard work made her earn money. She also got help from her own sons who started working and providing her money. The hard work of both mother and sons finally became fruitful. With the help of her neighbors, she had set a temporary clinic for the poor in the year 1996. Her neighbors had helped her either with money, manual labor or some other goods to build one storied building to treat the people. After that, 3 doctors from the nearby village came to this clinic to serve people without any material benefits. Another of her dream was to educate one of her sons as a doctor. The younger son of Subhasini Mistry, Ajoy Mistry is now a doctor and he works at the Humanity Hospital created by his mother. Nowadays, this clinic is a full grown Modern hospital with 25 beds and 12 doctors working to save the lives of poor people. The hospital mainly runs by donations. The story of Subhasini Mistry encourages us to believe that we don’t have to be extraordinary to do something extraordinary. If we really had the courage to chase a dream, we can achieve that even without the material advantages.